In June 1996, a new virus was discovered in Australia that later killed two humans. 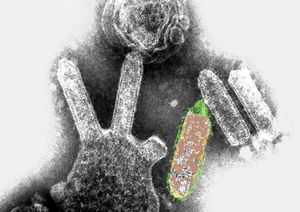 The virus was identified as a member of the lyssavirus group, and a close relative to classical rabies found overseas. This image is a coloured transmission electron micrograph of Australian bat lyssavirus. The finger-like projections are the virus, and it is shown budding off from a cell. Image produced by Electron Microscopy Unit, Australian Animal Health Laboratory.